For the former quarterback, see Jared Allen (quarterback). Jared Scot Allen (born April 3, 1982) is a former professional American football defensive end. After playing college football for Idaho State University for four years, he was drafted by the Kansas City Chiefs of the National Football League (NFL) in the fourth round of the 2004 NFL Draft. After four years with the Chiefs, he was traded to the Minnesota Vikings in exchange for three draft picks, including a first-rounder. He spent six years with the Vikings before joining the Chicago Bears as a free agent in 2014. During the 2015 season, he was traded to the Carolina Panthers, with which he made his first career Super Bowl. A five-time Pro Bowl and four-time All-Pro selection, Allen tallied 136 quarterback sacks during his 12-year career. Allen was born in Dallas, Texas, and raised on a horse ranch in Morgan Hill, California. Allen first attended Live Oak High School in Morgan Hill, but transferred to Los Gatos High School in Los Gatos for his senior year after he was accused of stealing yearbooks. By then, Allen had lost many of his athletic scholarship offers, including from the University of Washington, where he had already verbally committed. As a senior at Los Gatos, he was named First-Team All-League and Defensive Player of the Year. He was also a First-Team All-Central Coast Section selection, and a member of "Who's Who" in Sports Illustrated. Allen was selected by the North squad for the North vs. South San Jose Charlie Wedemeyer All-Star football game, after a senior season where he racked up 96 tackles, 12 sacks, five forced fumbles, and five fumble recoveries. Allen attended Idaho State University, where he started 33 of 41 games for the Idaho State Bengals football team. The three-time All-Big Sky Conference selection finished his career with 250 tackles, 38.5 sacks, 73 stops for losses, seven fumble recoveries, three touchdowns, 13 forced fumbles, three interceptions, 26 pass deflections, and one blocked kick. As a freshman in 2000, Allen was originally slated to redshirt the season, but this was reconsidered, and he eventually played in eight games for the Bengals and earned honorable mention All-Big Sky honors without ever being a starter. In 2001 Allen earned First-team All-Big Sky honors, and led the Bengals with 16 tackles for loss and 6.5 sacks. As a junior in 2002, Allen was named Second-team Division 1-AA All-American by the Associated Press, and was also named first-team All-Big Sky for the second consecutive season. He led the team in sacks, tackles for loss (with 18), and also led all Bengal linemen with 63 tackles. In 2003, as a senior, Allen won the Buck Buchanan Award, recording 17.5 sacks, 102 tackles, 28 tackles for loss, six forced fumbles, three recovered fumbles, and nine pass deflections during 2003, ranking among the Big Sky Conference leaders in several defensive categories. Allen, a first-team Division I-AA All-American and a first-team All-Big Sky selection for the third straight season, led ISU to an 8–4 record that season, helping the school post its first back-to-back eight win seasons in school history. Idaho State finished the regular season ranked No. 21 in the nation. Allen was drafted by the Chiefs in the fourth round (126th overall) of the 2004 NFL Draft, and made the league minimum his first three years. During his rookie season of 2004, Allen played 15 games (started 10) with 9 sacks on 31 tackles. In 2005, Allen gained more playing time by appearing in all 16 games (starting 15) with 55 tackles, 11 sacks, 5 passes defended, 6 forced fumbles, and 2 fumble recoveries. In 2006, Allen started all 16 games with 77 tackles, 7.5 sacks, 1 interception, 10 passes defended, 5 forced fumbles, 1 time fumbled himself, and a tied AFC leading 6 fumble recoveries. On May 21, 2007, Allen, as a restricted free agent, signed the Chiefs' one-year tender offer of $2.35 million for the 2007 season. Allen credited his early 2007 season success to his mullet. With every quarterback sack Allen made, he was expected to shave a "racing stripe" into his hairstyle. On December 2, 2007, Allen caught a touchdown pass against divisional rival San Diego. On December 23, 2007, Allen caught another touchdown pass against the Detroit Lions. Allen was elected as starting defensive end for the American Football Conference in the 2007 Pro Bowl. He led the NFL in sacks (15.5) for 2007. Allen was also the selected All-Pro team for 2007. In February 2008, the Chiefs placed the franchise tag on Allen, giving him a one-year, $8.8 million contract for 2008. Allen with the Vikings in 2011. On April 22, 2008, the Chiefs traded Allen to the Minnesota Vikings in exchange for a first-round pick, which they traded to Detroit in an exchange of first round picks, and which they subsequently used to select OT Branden Albert (Detroit used the first round pick from Minnesota to select OT Gosder Cherilus), and two third-round picks, one of which was used to take Jamaal Charles, and swapped sixth-round picks in the 2008 NFL Draft. The Vikings then signed Allen to a six-year contract, which at the time was the richest contract for a defensive player in NFL history. Allen was due an $8 million roster bonus in 2010, per the six-year, US$72.36 million contract he signed with the Vikings, and his signing bonus was $15.5 million. During the 2008 season, Allen recorded 54 tackles, along with 14.5 sacks, 3, passes defended, 3 forced fumbles, and 2 enforced safeties, while battling both knee and shoulder injuries throughout the season. He was named First-team All-Pro and selected to his second Pro Bowl. His first sack as a Viking was in a game against the Indianapolis Colts, when he sacked quarterback Peyton Manning. In his first playoff game as a Viking, Allen recorded three tackles, along with two sacks and a forced fumble. Allen also forced a safety when he chased Dan Orlovsky out of the end zone during a game against the Detroit Lions, and he forced another safety in the week 10 game against the Green Bay Packers, when he sacked Aaron Rodgers in the end zone. On October 5, 2009, against the Green Bay Packers, Allen set a career high with 4.5 sacks, as well as having his third safety in the previous two years. A week later, against the St. Louis Rams, he returned a fumble 52 yards, for the first defensive touchdown of his career. He also made the 2009 Pro Bowl, as the starting defensive end for the NFC team. For the 2009 year, Allen made 51 tackles with 14.5 sacks, an interception, 4 passes defended, 5 forced fumbles, 3 fumble recoveries, a defensive touchdown, and a safety enforced. Allen started the 2010 season slowly, having only one sack in the first 7 games, but had 10 sacks in the next 9 games, making him 10th in the league with 11 sacks. In the season finale against Detroit, Allen scored his second career defensive touchdown, a 36-yard interception return. In 2011, Allen returned to Kansas City, where his former team, the Chiefs, home field was. The Vikings lost the game 22–17. Overall in 2010, Allen finished with 60 tackles, 11 sacks, 2 interceptions (one returned for a touchdown), 6 passes defended, a forced fumble, and a fumble recovery. On January 1, 2012, Allen set the single-season franchise record for most sacks by a Viking, with 22 sacks. In Week 17 against the Chicago Bears, Allen sacked Josh McCown 3.5 times, but fell a half sack short of the NFL record held by former New York Giants defensive end Michael Strahan. Allen appeared on NFL's Top 100 players of 2012, and was ranked #13. Allen was voted 67 spots higher than last year, the biggest leap on the list. Allen fell seven votes short of winning AP NFL Defensive Player of the Year. On October 2, 2012, Allen was fined $7,875 for grabbing Tampa Bay Buccaneers lineman Donald Penn's facemask. On March 26, 2014, Allen signed a four-year deal with the Chicago Bears worth $32 million, of which $15.5 million is guaranteed, that can void down to three years and $24 million. Allen missed the week three game against the Packers due to suffering from pneumonia and having lost 18 pounds. As a result, his streak of games played dating back to week two of 2007 ended. He finished 2014 with 52 tackles, 5.5 sacks, 4 passes defended, 2 forced fumbles, and 2 fumble recoveries. With the Bears using a 3-4 defense for the 2015 season, Allen was transitioned to the outside linebacker position. On September 28, 2015, Allen was traded to the Carolina Panthers for a conditional sixth-round pick in the 2016 NFL Draft. Allen recorded his first sack for the Panthers during their 27-16 win over the Philadelphia Eagles; he also recorded 1 TFL, 2 QB pressures, and 1 pass deflection during the game. During a Monday night victory over the Indianapolis Colts, Allen recorded his first career sack of quarterback Andrew Luck to go along with 5 total tackles. Allen got to go to his first Super Bowl after the Panthers beat the Cardinals in the NFC Championship. In Super Bowl 50, Allen recorded only 1 tackle as the Panthers lost 24–10 to the Denver Broncos. On February 18, 2016, Allen announced his retirement by posting a video to his Twitter of him riding his horse "into the sunset." On April 14, 2016, Allen signed a one-day contract with Minnesota so he could retire as a Viking. Allen has been arrested/charged for DUI a total of three times. The first was in Pocatello, Idaho, on May 11, 2002. He was then arrested twice within five months in Leawood, Kansas, on May 11, 2006, and on September 26, 2006. He was sentenced to 48 hours in jail as a result of the latter arrest. In March 2007, Allen voiced his displeasure with the Chiefs' refusal to give him a long-term contract extension. No offers were made for Allen throughout free-agency due to the Chiefs' high tender for his trade (two first-round draft picks). On April 27, 2007, Allen was suspended for the first four games of the 2007 Chiefs' season, and he returned to the Chiefs saying he "will do everything [he] can to help bring a championship back to the great fans of KC." On May 22, Allen signed a one-year contract worth $2.35 million, but was liable to forfeit $552,941 of his contract because of a four-game suspension for driving under the influence. On July 16, Allen's suspension was reduced to two games following an appeal, and thus he forfeited $287,500 of his 2007 salary. Allen is a Christian. Allen has spoken about his faith saying, "My Bible’s my playbook for life" and "My ultimate goal is when I die, for Him to say, ‘Welcome home, you good and faithful servant.’ That’s how I try to gear my life and focus on Him." Allen serves as an advocate for the Juvenile Diabetes Research Foundation, and raises funds through his "Sack Diabetes" program. Allen was also an active role model in the JDRF's Children's Congress 2009. He is an avid hunter, and has been interviewed by Field & Stream. He was among four NFL players that were sent overseas on a NFL-USO tour to visit with U.S. military troops: "It has been one of the best experiences of my life – something that I'll never forget. We as players probably get more out of it than you do as soldiers and Marines." 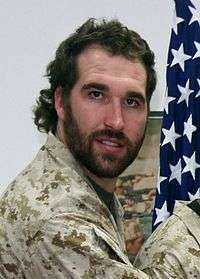 He created his own charity, the Jared Allen's Homes for Wounded Warriors (JAH4WW), in October 2009, in order to build handicapped-accessible homes for severely wounded military personnel returning from Iraq and Afghanistan. His grandfather and younger brother also served in the Marines. In September 2010, Allen contributed US$3,000 to Downey, California, animal shelter SEACCA's reward fund for information leading to an arrest, in connection to a horse being starved and abandoned on a Los Angeles city street. He was also featured in the 2010 film Jackass 3D, doing a stunt, alongside Erik Ainge, which features him blindsiding Johnny Knoxville. On October 27, 2011, Allen's wife, Amy, gave birth to their first child, a girl named Brinley Noelle Allen. ↑ "Jared Allen". NFL.com. National Football League. Retrieved March 24, 2013. 1 2 Stone, Larry (October 31, 2012). "Vikings' Jared Allen channels his inner beast". The Seattle Times. Retrieved March 24, 2013. 1 2 " "Personal". JaredAllen69.com. Retrieved March 24, 2013. ↑ "Jared Allen". NFLDraftScout.com. Retrieved April 15, 2009. ↑ Usatoday.com. "NFL Player Salaries - Jared Allen". USA Today. Retrieved 12 August 2012. ↑ "Green expresses frustration; Chiefs re-sign Allen". Kansas City Star, May 22, 2007. ↑ Clayton, John. Chiefs to put franchise tag on Allen, who wants to stay ESPN.com, 18 February 2008. ↑ "Archived copy". Archived from the original on May 1, 2008. Retrieved April 23, 2008. ↑ "Jared Allen Gets A Safety On Aaron Rodgers". Celebrity Net Worth. Retrieved May 23, 2012. ↑ "Blog Archive » Jared Allen on Finishing with 22 sacks: "Hopefully I can come back and one of these years get close to it again."". Sports Radio Interviews. January 3, 2012. Retrieved May 23, 2012. ↑ "Ravens' Suggs wins AP Defensive Player of the Year". NFL.com. Retrieved May 23, 2012. ↑ "Fines roundup: Richard Seymour docked for hit on Matt Cassel". National Football League. November 2, 2012. Retrieved November 2, 2012. ↑ Goessling, Ben (March 26, 2014). "Jared Allen heading to Bears". ESPN. Retrieved March 26, 2014. ↑ Florio, Mike (September 28, 2014). "Pneumonia knocks out Jared Allen". Profootballtalk.com. Retrieved September 28, 2014. ↑ Edholm, Ed (September 28, 2014). "Week 4 Injury Report: Jared Allen to miss first game since 2007; Locker out". Yahoo! Sports. Retrieved September 28, 2014. ↑ Alper, Josh (June 3, 2015). "Jared Allen "having fun" with move to linebacker". Pro Football Talk. Retrieved June 3, 2015. ↑ Patra, Kevin (September 28, 2015). "Panthers agree to trade for Bears' Jared Allen". NFL.com. National Football League. Retrieved September 28, 2015. ↑ Allen, Jared (18 Feb 2016). "Riding off into the sunset". ↑ ESPN.com (February 19, 2016). "Julian Edelman salutes Jared Allen's career ... and mullet". Retrieved February 19, 2016. ↑ Reed, Steve (February 18, 2016). "Panthers DE Jared Allen retires after 12 NFL seasons". The Denver Post. Retrieved February 18, 2016. ↑ "Jared Allen signs one-day contract to retire with Vikings | SI Kids". SI Kids. Retrieved 2016-04-15. ↑ Chiefs DE Allen to serve jail time for DUI in February 4 January 2007. ↑ Teicher, Adam. Chiefs' Allen will miss first four games of the season Kansas City Star, 27 April 2007. Archived April 29, 2007, at the Wayback Machine. ↑ Teicher, Adam. Green expresses frustration, Chiefs re-sign Allen Kansas City Star, 22 May 2007. Archived May 29, 2007, at the Wayback Machine. ↑ Teicher, Adam. Suspension of Chiefs' Allen reduced to two games Kansas City Star, 17 July 2007. ↑ "NFL Award Winner Talks Faith and Football". ↑ Jared Allen #69 Archived August 18, 2006, at the Wayback Machine. ↑ O'Brien, Ben (July 31, 2009). "Spear Hunting with Minnesota Vikings DE Jared Allen". Americanhunter.org. Retrieved May 23, 2012. ↑ "Johnny Knoxville Risks More Than Ever In 'Jackass 3D'". Starpulse.com. Retrieved May 23, 2012. ↑ Fowler, Jeremy. "Vikings report: Jared Allen all smiles after wife gives birth to first child". Pioneer Press. Retrieved 8 November 2011. 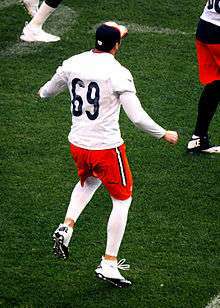 Wikimedia Commons has media related to Jared Allen.